There are lots of useful things people have and still use bone for. They can be used to satisfy practical needs even in our modern society. All it take is a little thought, imagination and ingenuity. Primitive people found a way to use bones to help with everyday living needs. They even used bones to catch their food. Fishing cultures were known to use bones to catch their food. 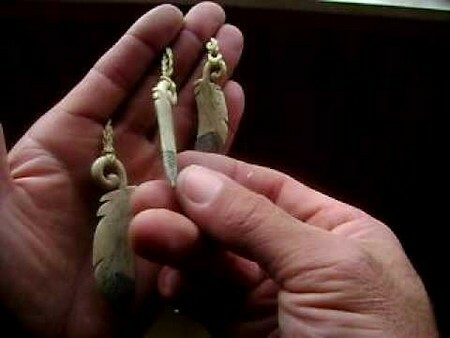 They could fashion their fishing hooks out of bones left over from a previous meal or kill. There are more than one type of hooks they cut from bone and other materials they had available to them. The Gorge hook is compromised from a linear, cut piece of bone. They feature groove and carved sections down the center of the hook to secure the fishing line. Composite hooks are composed of two parts of bone that are tied together to make a sharp letter “J” shaped hook. It has one peaked point. Other types of hooks include many versions of “V” and “J” shaped ones. These original hook were cut from a single part of bone with a single peaked point. These bones are relatively easy to make. Cut the Gorge hook as your first carving project from bone. Read on to find out how. Draw what your fishing hook will look like. Show the graduated parts on both of the ends and fashion he middle to curve for the fishing twine to fit. Carefully slice thin slices of bone away creating the points drawn. Cut the middle groove around the entire bone hook. You’ll tie fishing twine here. Sand all the points on the gorge hook down smooth. Keep the gorge hook sharp. Sand the middle smooth. Roll fishing twine around the hook. Tie it to the gorge hook. On a 1 inch chunk of bone carve a point. Remove them slivers in towards the middle. Make a knick on the opposite end. It should be able to fit the 1 ¾ peice of bone that is going to be attached. Cut knick on the 1 ¾ part of bone. This is the shank. Make this half the diameter of the bone. Place the hook and shank pieces together (make a “v” shape) and wrap them together using twine. Remove the extra twine. Cut a small dip in the upper part of the hook. Tie fishing twine on this notch. Be careful when using a knife to slice the bone.